As rare as it is beautiful. Welcome to the number one mountain-contemporary community in Steamboat Springs, Colorado. If you are interested in learning more about this extraordinary property, located only five minutes from Steamboat Ski Resort, we would be delighted to speak with you. 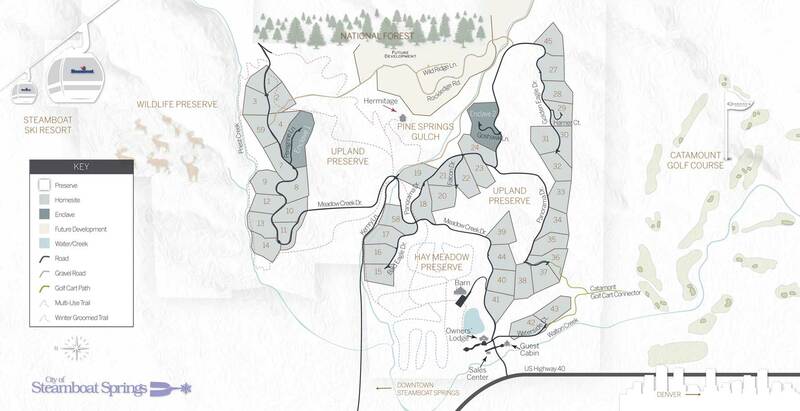 Ownership opportunities are available, and we invite you to call or visit our Owners’ Lodge & Sales Center. Call us at (970) 620-9246, or fill out the form, and we will contact you shortly. Car: Alpine Mountain Ranch & Club is located just 3.5 miles south of the Steamboat ski area on U.S. Highway 40. To get to the Owners’ Lodge and Sales Center, turn at the stone monument marking the entry, cross the bridge over Walton Creek and turn left onto Meadow Creek Lane. Parking is clearly marked. Airport: Alpine Mountain Ranch & Club is just a 22-minute, uncongested drive from Yampa Valley Regional Airport and a private jet center. Major carriers service the area with direct flights from cities that originate across the country. For detailed information on travel to Steamboat Springs, click here.